In the past we known about hundreds of Fake Encounters in Occupied Kashmir Civilians by Indian army. Yesterday an Indian Army major with three other People is booked for doing Fake Encounter of three Civilians in occupied Kashmir on 30th April 2010. Three Civilians where killed by Indian army in Fake Encounter by declaring them Mujahideen in Kupwara in April 2010. All three Civilians where killed by bullet wounds in their heads which is very unlikely when a gunfight takes place so its also proves that was an Fake Encounter. 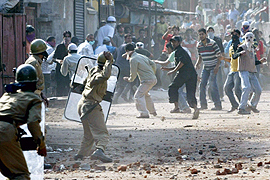 Chief Minister of occupied Kashmir Umar Abdullah has said that Justice will be done in this case.